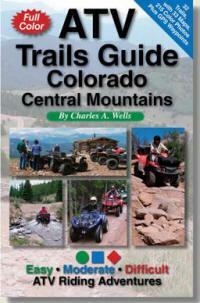 Precise directions, custom maps and stunning color photos guide to and through the best mountain ATV trails in central Colorado. Most routes are day trips from Denver and other front-range cities. Thrilling rides for all skill levels. Learn where to unload and the best places to camp. GPS Waypoints. Great for dirt bikes, too. Each trail description contains detailed GPS information (Shown in waypoint name as book N.) Set datum to:WGS84, Display as: hddd mm.mmm. To download all trails for this book in one file to use with your GPS Click Here. All photos and graphics used for sales promotion are copyright FunTreks Guidebooks, Inc.